Household net worth can move substantially within a few years--say, when the stock market or real estate prices have a substantial rise or fall. When household worth rises, people tend to save less; conversely, when household worth falls, people tend to save more. The Federal Reserve Bank of New York offers a nice illustration of this relationship in the April 2016 edition of its monthly publication, "U.S. Economy in a Snapshot." The horizontal axis of this figures shows household net worth for the US economy as a whole, expresses as a share of total disposable income in the US economy at the time. Thus, total household net worth in the last few decades has ranged from about 450-650% of disposable income at any given time. The vertical axis measures the personal saving rate. The blue diamonds show quarterly data on these two variables from 1983 to 2005, and the blue line shows a best-fit curve for the relationship between these variables over this time. What has happened since 2006 is shown by the red points, and the line connecting them. In the first quarter of 2006, a combination of high stock prices and soaring real estate values had driven the ratio of household worth/disposable income up to 643%, while the personal saving rate had fallen to 3.8%. However, the combination of the strop in the stock market and the fall in housing prices dropped the household worth/disposable income ratio down to about 500%. The corresponding change in the personal saving rate pretty much matched what would have been expected from the earlier data. As the stock market and housing prices recovered, so did household net worth. As the points defining the red line moved out to the right, personal saving rates at first seemed on their way to falling again. But in the last couple of years, the personal saving rate has stayed moderately but noticeably higher than would have been predicted from the earlier data based on household worth. 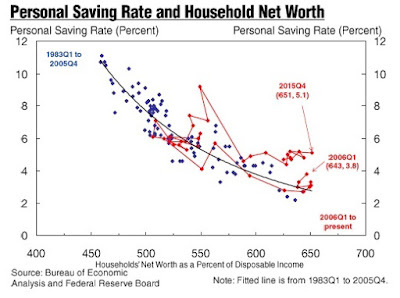 Obviously, lots of factors affect the personal saving rate other than just household net worth. For example, the New York Fed writes: "Restrained access to credit, continued high demand for precautionary saving, and increased concentration of wealth at the top of the income distribution may be potential explanations for this recent pattern." These potential causes will be researched and debated. But in the meantime, the tendency of people to save more than expected as their net worth rises is one factor that has contributed to the sluggishness of the economic upswing in the last few years. What is a "Good Job?"